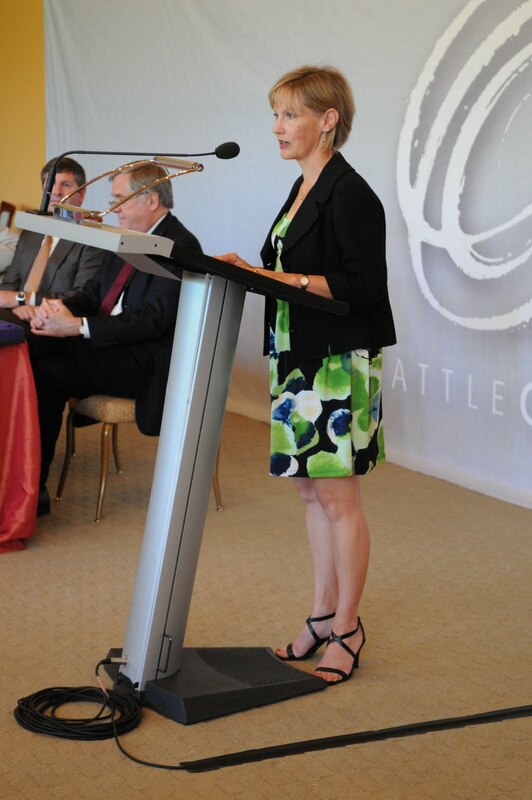 At Seattle Opera's Annual Meeting on August 3, 2010, Executive Director Kelly Tweeddale addressed the state of one of Seattle's leading cultural organizations in the wake of an economic crisis that has put many non-profit organizations out of business and seriously threatens many more. But economics isn't the only enemy. We share excerpts from Kelly's speech here in honor of all the people who dedicate their lives to mission-driven organizations and continue to envision a future that is as bright as the fight we lend to the cause. "For those of you that have attended one of Seattle Opera’s annual meetings before, this is the point when I give you an insider look of what it’s like to manage an almost $30 million company; an enterprise that any MBA graduate or for-profit executive will tell you is structured to fail. They don’t teach how to run a company whose commodity is passion. And whose currency is belief. Those are usually not the top two elements that financial analysts look for in a successful business plan. Enemy number one: a precarious economy. Opera is a perilous economic art form regardless, but today we are constantly reminded that doubt supersedes conviction; that change is constant and even though we were all taught how to count at the tender age of three, we now shouldn’t count on anything. Great opera requires commitments and decisions three to five years in advance. Schlock opera is what you throw together at the last minute when you finally decide the sky isn’t falling. The best defense against that type of opera is careful planning and earning the commitment and conviction of our audience and donors. For opera to survive, we, you, and the community need to believe that opera is a necessity, not a frill. We need to know we are in this for the long term, not just surviving the short-term skirmishes. Enemy number two: obsolescence. A year ago Seattle had two major newspapers, now we barely have one. There now exists generations of music lovers that may never discover us, because our business is geared to producing live performances. For many, live experiences are now an integrated trajectory of musical exploration that is taking place not only on the stage, but in the digital space. The space we call the internet, the mobile phone networks and devices such as the iPad and Kindle, are transforming how people are discovering their world and defining their interests. Seattle Opera has huge obstacles standing in the way of participating in these spaces and relating to the next generation of audiences; obstacles such as collective bargaining agreements that prevent the digital release of no more than 3 minutes of content, the inability to use performance content as a teaching tool in the classroom, outdated rules that make DVDs, CDs, or downloadable product extraordinarily expensive to produce. For example, if we were to produce a DVD of our current Ring Cycle it would have to retail at over $2000 a piece and sell at the top of the classical Billboard charts to have even a remote chance of breaking even. That assumes that the many participants (orchestra, singers, creative team) in the production would give permission to move ahead in such an endeavor. At this time the ability to decide on Seattle Opera’s digital destiny is not in its hands. Compare that with the entertainment industry that is flooding the market with both free and paid experiences that not only enhance the live experience, but is capturing the hearts and minds of our future audience. I know, I’m a mother of a teenager who has been inundated with live opera performances since the age of 4, but we don’t exist in her iPod, on her computer, or what she shares with her friends. On her digital odometer, we are a zero. Enemy number three: the emergence of a risk-averse approach to creativity. Art, especially opera, is only created by taking risks. And because opera is a collaborative art form, it has to be a collective risk. Art is at its best when it is provocative, inquiry-centered, and dares one to explore his or her world and be exposed to alternative perspectives. In an effort to safeguard against the unknown, i.e. the economy, we also risk putting forth the biggest casualty of this battle: Creativity. Once creativity succumbs to convention, we have lost the war. Whether we are the Grail knights of Parsifal, protecting the Holy Grail we call opera, or a staff of starry-eyed performing arts devotees, what I can say is this year has been fought by an amazing army of sure-footed and fierce warriors. So here's to the staff dedicated to the mission of education that allow us to transform young people’s lives; the marketing personnel that continue to attract audiences despite pundits that predict slippage in double-digit percentages; the communication crusaders that explore new outreach methods and technologies; finance staff and CFOs that keep the bills paid, cash in the bank and expertly manage to secure lines of credit even in these times when banks are not lending; and production and technical teams that continue to pull off their magic on the stage and in our case, not sacrificing ambition even while coming in under budget and continuing to exceed expectations. Our development staff and trustees made sure that Seattle Opera was at the forefront of our supporters’ minds, even during these difficult times; and let us not forget the human resource directors who keep us in good humor, help us embrace change and remind us what it takes to create a great place to work, battle or no battle. And of course, Seattle Opera only flourishes thanks to the talented musicians, singers, craftspeople and crews that make sure what we do soars above mediocrity. So, for Seattle Opera we survived this year intact. How did we do it? An old proverb says: “He who is well prepared has half won the battle.” We are fortunate that our relationships with our many unions helped us to make quick adjustments, our staff sacrificed earning potential and took on more work. And we were prepared with no accumulated deficit, and a plan. We cut expenses, protected the art, and believed that we would succeed. Creativity will not be a casualty of this war. No battle is won without battle scars. We said goodbye to colleagues as we trimmed our operations. We postponed projects that this aspiring, dedicated company has every right to achieve. And we tuned out the many voices that predicted failure at every turn. Resourcefulness is a great balm for uncertainty. But we also have the future. As we begin this new season, I can’t help but think of the quote by Winston Churchill, as he neared the end of World War II, “Difficulties mastered are opportunities won.” All I can say is that if this past season is any bellwether for Seattle Opera, opportunities abound." Hallo, Ms. Tweeddale (& Jon)! Thanks for a well-reasoned report on the "State of Seattle Opera"!! On one point, however, I do disagree: Opera in operahouses has not been "done in" in the past´and will not be "done in" in the future by electronic media. Even TV and opera on DVD have not lessened the crowds that fill McCaw's 2900 seats for sooo many performances. If those have not shrunk audience-sizes, I am convinced that no other electronic device can beat the pleasureof being at a live performance of an opera, truly the "gesamtest" of Gesamtkünstwerke!!!! Opera has a great future as long as it is managed by people of the high quality of Speight Jenkins and Kelly Tweeddale and presented on stage by artists the quality of Annalena Persson, Clifton Forbis, and Greer Grimsley, conducted by as truly great a musician as Asher Fisch!!!!! And they all sound far better live in an opera house than in any other medium!!!!!!!!!!!!! !